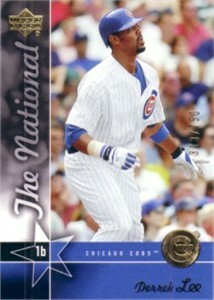 Derrek Lee 2005 Upper Deck promo card distributed exclusively at the National Sports Collectors Convention in Chicago. Individually numbered out of only 750 produced. NrMt. ONLY TWO AVAILABLE FOR SALE.